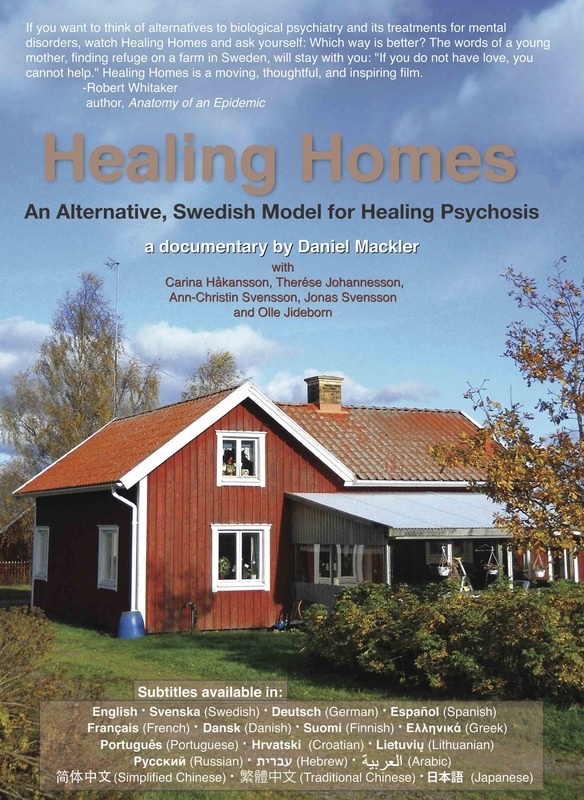 Healing Homes, a feature-length documentary film directed by Daniel Mackler, chronicles the work of the Family Care Foundation in Gothenburg, Sweden — a program which, in this era of multi-drug cocktails and psychiatric diagnoses-for-life, helps people recover from psychosis without medication. The organization, backed by over twenty years of experience, places people who have been failed by traditional psychiatry in host families — predominately farm families in the Swedish countryside — as a start for a whole new life journey. Host families are chosen not for any psychiatric expertise, rather, for their compassion, stability, and desire to give back. People live with these families for upwards of a year or two and become an integral part of a functioning family system. Staff members offer clients intensive psychotherapy and provide host families with intensive supervision. The Family Care Foundation eschews the use of diagnosis, works within a framework of striving to help people come safely off psychiatric medication, and provides their services, which operate within the context of Swedish socialized medicine, for free. Healing Homes weaves together interviews with clients, farm families, and staff members to create both a powerful vision of medication-free recovery and an eye-opening critique of the medical model of psychiatry. NOTE: I have decided to place all of my films on Youtube for free, because I want to share them with the world. You can still purchase DVDs of the films if you wish, but I don’t want money to stop anyone from receiving their message. Here’s to a revolution in the mental health industry! The DVD and trailer for this film are also available with English subtitles. Hi, Daniel. I just watched Healing Homes; this is a wonderful and thoughtful film. Have you ever considered submitting it to be shown as part of the POV series on PBS so that more people could see it? Just wondering. Thank you for posting. 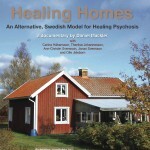 I was wondering if theres a database of such healing homes that may be operating within the US ( or abroad)? I am currently in Fl and seeking alternative ways to help my son. This is the type of thing we are looking for. Thank you very much. I work as a Music Therapist for 12 years in Acute care Geri psychiatry. Love this program! Do you know if it is happening anywhere in or near NY City. Keep up the good work. I’d love to be inviolate do somehow in the movements that are laboring to remove the traditional psychiatric system of thought and treatment, any thoughts for me? Hi daniel what do you think about this new discovery of the scientist? Researchers have identified a gene that increases the risk of schizophrenia, and they say they have a plausible theory as to how this gene may cause the devastating mental illness. After conducting studies in both humans and mice, the researchers said this new schizophrenia risk gene, called C4, appears to be involved in eliminating the connections between neurons — a process called “synaptic pruning,” which, in humans, happens naturally in the teen years. Is that something organic not only psychological? Hi Daniel and thank you for this article among all your others. It’s tragic to read all the comments from people looking for help and not finding it. My question is a bit different as it seems from my own situation that rather than finding a supportive home for my husband to hopefully “recover” in (recover in “” because he needs to go forward to something new, not back to what was, which was never good), I have to somehow build that supportive home for him within our home. It’s not simple as we have 9 children the oldest of whom is almost 16 and although he usually tries very hard to shield them from seeing him in unstable states, not always does he manage, though they’ve never seen anything really terrible and certainly no violence – he is very far from being violent. I’ve been looking for a good therapist for years now to no avail. There is someone now who looks more promising, but it’s still going to fall on me a lot – there’s no other option it seems. I think that where the person’s problems originated in the nuclear family and they’re still living there, getting out could be a very good thing; however, my husband was already with his set of problems when we married, although it was all hidden under the drugs. He was on them for about 20 years until I got him off, with so much opposition from all sides. Today I still find myself virtually isolated in my belief that there is not only a way, but a much better way, without the drugs. Can you give me any advice for how to be what he needs me to be in order to heal? How to motivate him to work through his emotional pain and accept the imperfections of the people who have hurt him. How to build up his sense of self so that he can hopefully get past the paranoia which turns into terror that he is being spied on 24/7 by hidden cameras? Following are several success stories. I have also compiled cases history to see what went well and what didn’t. Since we receive no money from the government, and no insurance, we have to charge what I calculated to be the fairest. One of my set up is on 47 acres with a capacity of 6 clients. The other on 20 acres with also capacity of 6. I do not want more than 6, I am trying to keep it like family setting. This of course requires more staff than if I had lots of people in the same place. I have 11 staffs working for me. Half of the money I make go to salaries, the balance in mortgages, repairs, improvement. Not much left for me but the goal is not the money. I would like to set up an actual hospital in the USA where people could go as an alternative to psych treatment and drugs. Often, when we don’t have the results desired it is because the client could not stay with us long enough to recover. There have been other instances when a client would come to us but needed in reality an hospital set up because of violence or potential self-harm. And those we cannot keep because of our level of licensing. Some were a no result because they absolutely insisted to leave and we can’t force anyone to stay of course. We also had some that had brain damages caused by meth or LSD or even too many psych drugs for too long and those, we were able to give them a quiet environment, safe and they would get better but not enough to be able to go back to society and get a job. I believe that our success however is pretty good. Please read on and judge for yourself. What a journey last year was for Karen, you and all those that were involved in C….’s recovery. He finally pulled it together, he got a job at the Hilton. He than got himself a 2 bedroom/ 2 bath apartment. He also proceeded to get himself a savings account and his drivers license. It was quite remarkable considering the fact that he was so mentally unstable earlier in the year. When I went to visit him in November I was impressed on what he accomplished. He is now in Florida searching out job possibilities and opportunities. Your guidance and help made a major difference in his life. Karen was also such a blessing to him and never gave up on him. Thank you so much. appreciate all done on our and A…..’s behalf. Fondest personal regards to you and Anne. That is by far the most he has said to me in over 10 years – even before he became ill – a huge improvement!! Dear Marc, thank you so much. I’ve seen all of the weekly reports you send to R…. and the one about the phone call & I am totally blown away. All of us are! Thank you so much for the wonderful work you do. I will not hesitate to send you anyone else in the future. This is fantastic progress report! Thank you for your work and dedication! Please let P…. know that his family members are sending him love. Have a good week and tell your staff thank you for all that they do for C…. Thank you Marc for helping save peoples lives. Sincerely S…. Thank u so much for taking C…. out. He sounds better, more lucid. You have been such a blessing to my Son. Thank u. My heart is dancing and singing with your update! I would also like to ask for donations for you if that would be acceptable to CCHR. Jim also suggested that I do a video separate of tomorrows event. How can we set this up quickly and how and where do donations go and getting receipts Etc. his manifestations have seemed to subside and he seems much more calm. that he really appreciates it. It’s been a blast. Okay, so that’s an overstatement once again. In all actuality things at hand have been so much more greatly understood. My gratitude is immense. My heart is fuller once more but I never thought it would have to come to such an extreme. I guess that’s life especially in my world it seems. What it took to get back to good again was like woah oach ouch och. I’m so thankful for caring concerned well meaning people that have always been here and hopefully always will. Here’s to them! My son, M….., has been in the “mental health system” for 22 years. The standard treatment of drugs and behavior modification has provided no improvement for him. Actually, it appears obvious that this form of treatment has been detrimental to his well-being. This treatment makes Michael feel oppressed, ignored, and insignificant, not to mention the harmful physical and mental side effects. The Life Center uses a different approach. It is by no means just another group home. The supervisors show a genuine concern for their clients. They make every effort to make personal connections and provide the best care nutritionally, emotionally, socially, and mentally. Since M….. has been there, he has improved. He is free to be himself and express his feelings without judgment. When one has these freedoms, he or she feels accepted. For some people, this is likely the first time in their lives they have felt accepted. The feeling of acceptance leads to trust and trust leads to connections with other people. When real connections develop, healing can then begin. I see this happening with Michael for the first time in his life. Other group homes where he resided did not provide these essential elements for healing. He never improved in these environments. The Life Center and the development of other places with the same approach is essential for the help and healing of the many people who suffer with mental disturbances. This is not a place to simply be housed and maintained, but to heal and eventually move into an independent life. It offers real hope. feel a huge difference from when I first came here, two short weeks ago. My first week here I learned about overts, withholding, ethics and morals. Alot of the information I got helped me a lot mentally; I was able to make more sense of myself then I had been before. The courses I took also helped me a surprising amount, at first I was frustrated about having to demo different things because there where times I had trouble showing what I was trying to say, but as I did more and more I got the hang of it. I have learned a lot about trust and honesty too, neither of those have really been my strong point but I am really making an effort to change that. I also learned that people, as human beings, are ‘basically good’. I didn’t really believe that I was a ‘basically good person’. It was difficult for me to think of myself in that way after months of lying to people, and making a lot of very bad choices, but the people here along with the courses I’ve been taking really have helped change that. I’m surprised with the huge difference in the opinion I have of myself. I do think that I am a good person and that I DO want to make the choices that are the best for me and the people around me. In the relatively short time I have been here I know I have changed a lot for the better. I want to thank Marc for his vision of a long term community for people that can’t really stand up to the pressures, pitfalls and counter-intentions of the everyday world. A place to safeguard them from the psyche trap built into society at this point. There’s the vision and then there is the point that the rubber meets the road. So thanks also for all the hard work, create, persistence and let’s face it, finances, that he put into this first of its kind safe haven. I am happy to say that Leah is now safely and more or less happily ensconced (perfect word) in her own home as of tonight. The very first settler to populate the community. She walked into her new home and her indicators came in immediately on the amount of space and the overall havingness of it. I could tell she was quite happy with it. When I first started the program, I was very foggy and unclear headed. I was groggy all the time. I flat out just did not have a lot of energy in general. Now that I’m done, I feel like a brand new person. I can think again. I’m motivated and ready to take on whatever life has to throw at me. Now when I wake up in the morning I can actually get up out of bed. I am more than grateful to have had the opportunity to be able to do this program. Like I said through I am just utterly amazed at how much more alert, focused, motivated and energetic I am now. I just really feel like I was able to take my life back after all of these wasteful years of doing various drugs. I’m finally in control once again. My son became violent and out of control after taking some unknown designer drug. For a long time I was trying to help my son recover from that experience. I refuse to let him in the hand of psychiatrists as all they would have done is give him more drugs which would have turned him into a zombie. My son would destroy any apartment or motel room I would rent for him. I had no place to put him. I found out about Marc Vallieres’ place and asked him if he could help me. Marc went out of his way to accommodate my son. He calmed down quiet a bit. My son began to show marked improvement. He stopped being violent and has not been for months. He has begun to help Marc around the property. He is also cleaning his cabin regularly. He still needs to learn to take showers on his own and he is not ready to function in society. Without the help that Marc provided, I would have lost my son. It is imperative that Marc’s activities be allowed to continue. Psychiatric treatments do not work and the alternative Marc provides is very much needed. Our daughter took crystal meth for two years. This completely destroyed her life. We wanted to help her but we were very reluctant to send her to a psychiatrist as it would mean more drugs and from the data we gathered, those drugs could have made the situation worse. We knew that Marc Vallieres had a ranch in Tennessee which would sometimes take care of people in trouble. We asked Marc if he could take care of our daughter by providing a safe environment away from large cities where she could stay. When she lived in the city, she would become involved in drugs and would end up being around people who would abuse her, endanger her and add to her misery. Since she has been with Marc she had improved tremendously. She used to cry every day, she doesn’t anymore. She used to break things around the house. Now, not only is she not doing that, but she helps with house cleaning, cooking and taking care of the animals. She has not touched any drugs or alcohol since she’s been there, almost a year now. We can’t thank Marc enough for what he has done. He has shown incredible care and dedication in helping our daughter; despite the difficulties this causes him and his family. We have found no other place in the United States willing or able to do what Marc is doing. Marc is the only hope we have for our daughter. He needs to be helped in his endeavor. PJ is doing very well. It was amazing how different he was when he came home…everyone noticed the change for the better….and he continues to improve his communication and relations with others on a daily basis. He was just so happy to be home with his brothers, we kept him quite busy over the holidays…I think a bit too much at times, but he is getting used to the busier schedule. He is living in Present Time (we only had one incident of being restimmed and handled it very quickly) otherwise he’s been doing really well and he’s even got the go ahead from his physician to start driving … with someone in the car…and only during the day and he has a couple times and done perfectly. He’s following the reduction plan that you had him on through the direction of Jim Harper. We have not changed the process at all as it continues to be a success. You would be very surprised at the change in PJ’s appearance…he slowly cut his hair to a nice clean cut look. All of the good hygiene and personal habits he picked up on in Tennessee have stuck with him…he refuses to allow me to help with cleaning his room, clothes, etc….which I tend to be on auto pilot at my house…he stops me at his door J My mom and I only noticed he had one bad hygiene habit of not brushing his teeth so she bought him a Sonicare tooth brush to motivate him and it worked! PJ remembers you telling him that he is an adult and needs to be independent from his mom and dad…he also learned from you how to handle an upset with someone…which was such a concern of mine having him come back to the house where he always got restimulated, he did very well because he learned through your actions when he was upset with you…you would let it be and let him come to you when he was ready to communicate again…it stuck with him and he told me that he knows to just walk away when he doesn’t want to talk at the moment and when he does he will…so far not one upset has occurred in the house…it’s very encouraging to see the positive impact you had with him and his well-being. My wife and I want to thank you and your team for all the help you gave us during that very difficult time for us. It has been a long time since we were up there and I thought you might like a little update on how it is going now. She is still a bit weak physically and has to be careful not to over do it with exertion, but emotionally she is now back to her wonderful self again. P………………..
My husband had chronic insomnia and this was affecting him physically, mentally and spiritually. We had seen many doctors but none of them offered any acceptable treatment. His condition became worse and we knew we had to do something and were referred by a friend to the Life Center for a New Tomorrow. After talking to Marc and Dave I was convinced they could help him. They helped us arrange transportation and my husband arrived safely. After a few days of care he began to sleep more. He was in a quiet, peaceful location where he could recover with people who cared for his every need . After a few weeks he was sleeping and was in much better spirits. He left the Center in much better condition than when he arrived. Our family is so very grateful to all the staff who cared for him. I have received nothing but great TLC, love, good food and rest here at the Gateway to Freedom. I loved my staff here. Highly recommended. The end result of your work is amazing! I wish that this type of treatment was more recognized in society rather than the “drug for a drug” method. To be able to read your encouraging words along with Karen’s in the past few weeks have been very uplifting. Compared to the reports when he arrived in June to now it is night and day. Zach is a really great person and I hope that this time around he sees what he has gone through and continues to better himself and work toward survival. I also hope that he sees that he is a great person and deserves better. Your center was his first stride in dealing with his dynamics in life and he has many more steps to go and I can’t thank you and your staff enough. I wish you both a safe flight tomorrow. Thank you very much for opening up a business that helps people get well. Eventually your type of business will take over and there will be no more psych wards. Being at the Life Center and taking the Road Back program has made me a more calm and confident man. I have never felt so good in my life. I liked the whole program. The meals were great, the staff are friendly and the location is very magical. There is something very magical and healing about the Life Center and many people benefit then fold from living here. I’m so happy that Ted called me today. He doesn’t know how much we love him and how much our connection to him means to us. I don’t know if you were with him or not, but it was a short call just to say hi. He said he loved me and “thank you for all I have done”. I asked how the weather was, he said it was getting colder. That was it. I cried after we hung up. He sounds like Ted. It’s like someone coming back from the dead. This is the kind of success which will turn around the field of mental health and get it pointed in a pro-survival direction. Thanks for all that you have done, are doing and will do Marc! FYI G….. has been calling my wife and I daily now for the last few weeks and she has been the best we’ve see her in ages. No real troubles at all except for last night. She called my wife and was mid a “panic attack” and talked to her for maybe 15 min and that was it. She called again today and seemed just fine. It seems overall to be WAY better and I thought you guys should know. ATMC in Arizona is not connected with Scientology. I have had several dealings with them and they used alteration of Scientology technology. They often send people to us who they tried to help and could not. The main reason is they reduce the meds too fast and the client has a psychotic break. They then send the clients to the hospital to get “stabilize” which means given drugs to calm them down. When someone comes to the Life Center to be reduced of meds we used the protocol given by the Road Back program. http://www.theroadback.org. It is a safe and slow method of reducing the meds and can be done at home. We also work with a psychiatrist who’s philosophy is the least drug to no drug is the best. The Life Center is not a Scientology organization but I have been a Scientologist for 40 years and the technology of the mind found in the research of Mr. Hubbard are very practical and very workable. We have a lot of success stories. If you’d like to read some I can send them to you. I heard a similar thing about the Alternative to Meds Center — they told me that they were not a Scientology organization but that the leaders members of Scientology. So I have some wariness about that, and also about their style of marketing. Also, they wanted to give me a finder’s fee for sending people to them, and that really troubled me and I found it unethical. I couldn’t do that — wouldn’t want to. I’ve never made money by referring anyone anywhere and I told them that. That said, I imagine they do help some people get off psych drugs — but I have also heard some pretty bad stories about things that didn’t go so well there. Of course, I hear these stories all over — from lots of different places. Meanwhile, although I am not a fan of L. Ron Hubbard or Scientology I do appreciate your openness. Also, I am actually just as interested in the non-success stories as in the success stories. I think they can both tell a lot. Hi! My brother is now in the hospital, and he doesn´t want to take medication. I understand it, so I am looking for a place for him where he can work himself without medication. I don´t find alternative here in Spain, only for when he leaves the hospital. The places I find are with medication. I know some people that can help, but only with teraphy once a week. The problem is the day- by day. He has no friends, broke all his relations and live with my parents, with who is very violent. I hated to put him in the hospital, but we really didn´t see other option in that big crisis, and he didn´t see he was not healthy. He is now very scared of the medication and tells me that this is the end, and he will never recover. I am very scared too. Do you know something here in Spain? A place to live to recover? Muchas gracias :), y gracias por la ayuda que brindas. hi marc. i am curious about your work, but also skeptical. it seems moderately expensive — $2000 a week — though of course there are more expensive. also, i wonder if you are connected with scientology in any way. your work sounds a bit similar to the “alternative to meds center” in arizona and i know they are connected with scientology. and i have heard mixed reviews about them. also, i want to share why i am skeptical. i see a lot of places claiming to help people get off psych drugs — and because of the things i here i am not so quick to trust. also, i know that many people are desperate for help and willing to spend large sums of money if they even a small hope of it working. i think some places can take advantage of that. i’m not saying that your program is, i just like to know more before i recommend places, especially ones that cost a lot of money and reach out to do marketing. You are doing great work and i love your passion. We need more people like you. Do you know of any therapists/groups in Toronto Canada who use the Finland approach for psychosis. My sister of 52 had a first psychosis in jan of 2014. She’s been on meds now for about fourteen months but she is now weaning off of the meds.. She has done very well. she was in hospital fo three days and has taken very low dose meds and has never had any comlaints since then. I am hoping this is a positive sign and would love to get her some sort of treatment after she is finished with the meds so that she could heal. She works and is doing well. and also krista mackinnon. http://www.familymentalhealthrecovery.org/ is her website. she’s from toronto and knows the lay of the land there, but i believe she doesn’t live there now. these two films capture many aspects of the better programs of the world. so they would be a good place to start. i would also check out madinamerica.com under their resources page: http://www.madinamerica.com/resources/ that should help too. I have a daughter with (drug induced) psychosis(she is not using drugs from 5 year but she is still psychotic ,sadly . )Can you please send me any contacts where my daughter (26 year old,she was world champion in show dance,but now is in very bad mood) can get help? We was trying Ayurveda medicine ,orthomolecular therapy . Sadly now she’s on medication for the last 2 months and I don’t see any positive change. This was her second time being held at the hospital.The traditional psychiatric treatment has not led to good results. I cannot even seem to get a good therapist or place here in Hungary. I take her (she is living with me ,she cant live alone)to best doctors from here ,all over the country but she can tolerate the anti-psychotic what is without use for people. Soteria in Hungary is closed sadly. Please is there a possibility if I take her in Sweden to the Family Care Foundation located in Gothenburg?…………………..is there any possibility for we can we get help from them ? I really need some good advise. So if you could send me information (via email) I would really appreciate it. I am in touch with people from here Hungary who was running the soteria,and with Andrew Feldmar but they same don’t know what can I do.I was trying many many thinks but I am convince that a place like in Sweden is the key to recovery. They closed soteria because of financial problems sadly. My 35 year old son has schizophrenia .Let me know if anyone is willing to open homes to help them without medicines and using open dialogue. Dear Daniel, my husband suffers from schizoaffective disorder and the traditional psychiatric treatment has so far not led to any good results. Is there a place in Europe using methods similar to those in Sweden and Finland that accepts foreigners as patients? We live in the Czech Republic, but would be willing to move for the treatment if it was really beneficial. I hope this finds you well. Simply, thank you. I can FEEL your passion and embrace your awareness. Your work and message truly resonate with me and my guiding principles. Will you be presenting in New York in near future? Are there ways that others can get involved? Thank you Daniel for responding so quickly, and also for being so human about it. I am keen to work with a professional if you do find some one you like in Melbourne. Also Daniel, if you are ever in Melbourne again it would be great to catch up! Hi Daniel, thank you for what you are revealing. Is there a base in Melbourne Australia where assistance is offered, even visitations for psychosis potential recovery? No expectations, just hope! p.s. i lived in melbourne in 1993. went to melbourne uni as an exchange student — studied biology. long ago!! I have a son on drugs with likely drug induced psychosis. Is there a place in California that uses your methodology? I have a son with schizophrenia and he was just released from the state hospital into a group home. This was his second time being held at the hospital. He had his first psychotic break when he was 19 and it took us over a year to get him help because of his civil rights. We brought him back with natural medicine and then he broke again two years ago and it took us another year and a half to get help for him. We are in the process of obtaining guardianship over him with his consent. I would like to open a dialogue with you by email for help with information for I am starting the process of establishing healing homes here in the USA for my son and people with diagnosis’ such as his. I believe in the power of natural medicine to effect a tremendous healing effect upon people with mental illness like my son. I also know first hand of the need for psychiatric medicine to bring them under control of themselves. After that, though, I believe they can experience the freedom that comes without the need of such medication as their minds and souls begin healing. Our family has experienced the long dark night that families of people with schizophrenia go through as we watch our loved ones suffer with this diagnosis; and with the HIPAA laws, we have experienced the rejection and isolation by the mental health profession from our loved ones because of their mental paranoid states. How can our rights to our children be taken away in regard to our adult children with mental illness when it is the result of the psychiatric disorder that robs them of their ability to stay connected to their family? In this country we need to bring a more balanced approach to the HIPAA laws in dealing with the psychotic and their families. Please, if you are agreeable to talk with me I am most grateful for your knowledge and information. Thank you. Pamela, I would very much be interested in helping you organize. I have a son who suffers from bipolar i. Anti-psychotics, hospitalizations, just seem to make it worse. I would greatly appreciate your help! My son did not even last a month in the group home before being held again on a Title 25. He is again in the hospital and is ready again to be released to the group home after being held again for over 5 months. We know the pharmaceuticals can help stabilize but cannot heal the brain. I am interested in creating a healing center with assisted living units in a rural setting and utilizing a natural approach using ortho molecular medicine based upon Abram Hoffer’s work with schizophrenia, spiritual healing, homeopathics and new brain science that can target the specific receptors that are malfunctioning, along with other healing modalities. My suggestion to you is if you have some control over your son to look at Hoffer’s work and begin adding the supplements he recommends, especially the niacinamide and vitamin C. If you can find a doctor that does Electral Dermal Screening, then that will target exactly what your son needs to bring his body into balance. It takes time to use this kind of approach and it is best to utilize the pharmaceuticals along with the natural medicine and find a psychiatrist that will adjust the dosage of the anti-psychotics as the brain heals. I am afraid those types of doctors are hard to find. I created an email account that you may use to contact me and we can see what we can do to effect a change in the way our sons are treated! Thank you from my heart. I know that no one wants to take anti-psychotics, yet when the psychosis is so severe that the person has lost all sense of reality then those medications can stabilize and allow the person to gain some control over themselves. A holistic approach to mental illness is the better way, yet that approach takes cooperation with the person suffering from psychosis. Sadly, when the person is so psychotic that they feel threatened by everything and everyone then they lose the ability to help themselves. The best approach for them is to use whatever is needed to bring them back and go from there. I have seen the extreme with my paranoid schizophrenic son and I want to help others bring their children back. I am a Taiwanese, my problem as same as Kalpana Atluri. My sister is suffered from schizophrenia. But the doctors in Taiwan said that it doesn’t have another ways to treat except medicine. I plan to find a good therapist abroad. Would you please to recommend me? How much is the whole period of treatment? How long is it? Greetings from the USA. I actually do not know any good doctors/therapists in Taiwan. Or any good programs. It’s very hard to work with therapists/doctors in a different country — unless you move to the other country. Are you planning to move? For therapy with people diagnosed with schizophrenia often the therapy lasts a long, long time — years in many cases, if it works at all. I think it’s much more difficult to work through those kinds of problems quickly, especially if the person is taking psychiatric medication. The medication generally makes it much more difficult to work through problems — in most cases. If you are planning to move abroad — outside of Taiwan — please post here again and I will reply to you backchannel by email. I might have some ideas — maybe?! Can you please send me any contacts where my teen son can get help? He’s on medication for the last 3 months and I don’t see any great positive change. I cannot even seem to get a good therapist here in CA. How do we even go about getting a therapist who is experienced in open dialogue techniques. DO we have to take him to Finland for this approach? We really need some good advise. I too would like information on who does Open Dialogue treatment in the US. I just ordered your documentaries because our son has psychosis and refuses to take medication but needs some guidance. So if you could send me information I would really appreciate it. Greetings from New York. Hmm…..nothing so great going on yet with Open Dialogue in the USA. Some early stuff — trainings in Massachusetts, some stuff around Boston and in the Berkshires, but no stable programs yet. There are some programs (like the Windhorse programs) that are trying to incorporate some things from Open Dialogue. Also the Parachute Project in NYC — taking some components of Open Dialogue. But it hasn’t been replicated in any sustainable or comprehensive way yet… Unfortunately there’s nothing remotely of the quality of Finnish Open Dialogue (or Swedish “Family Care Foundation” — of the movie Healing Homes) in the USA. Not yet…. Hopefully more inspired ideas will grow in time. Meanwhile, I’ll email you backchannel as well. Wishing you the best…..wish I had some great answers… At this point a lot of what has to happen is that people, families too, have to be creative in designing their own programs and figuring out how to make the best, creatively, with existing resources…..especially whatever good local resources exist…. And many of the American psychosis-oriented programs are extremely expensive — ten or fifteen thousand dollars a month, or more….ugh…..
Where can one buy the film?